Well I’ve been back from Gen Con for a few days now, getting back into daily life and cringing at looming illustration deadlines. It was great fun, and I have already signed up for a bigger booth for next year! After driving for two days with a short stopover in Pittsburgh to see my family (halfway point on the drive), Scott and I got to Indianapolis on Wednesday, August 14, with lots of time left to set up our booths in the art show section of the dealer’s hall. Our friends Owen and Sarah flew in – Owen had a booth too, and his wife, Sarah, was his assistant for the weekend. All our booths were near each other, which was nice. Thursday was day one of the convention! 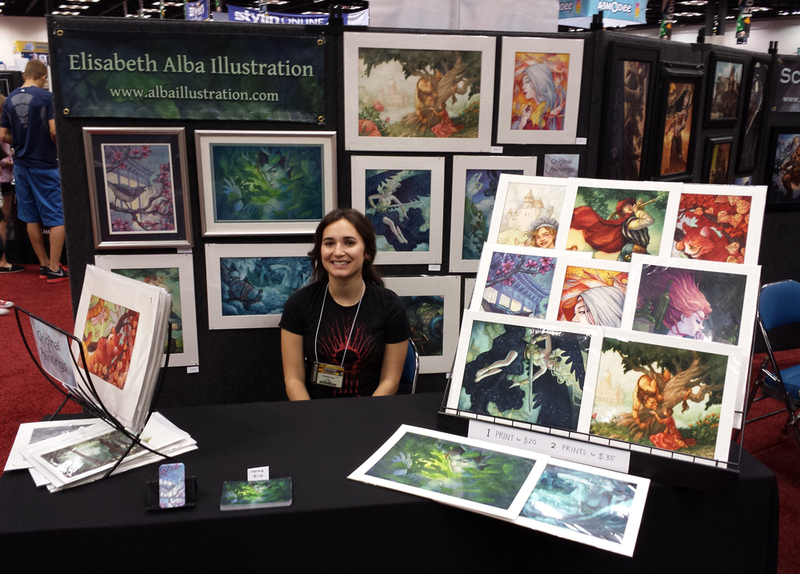 This was my first artist booth so I didn’t know what to expect or what to prepare for. It was pretty successful for me though. I met a lot of really cool people. I sold a lot of prints (which I ordered from INPRNT, where I have a new print store; I decided I was through making my own prints, it’s awful and tedious and I wasted so much ink and paper. The INPRNT prints look fantastic though!). 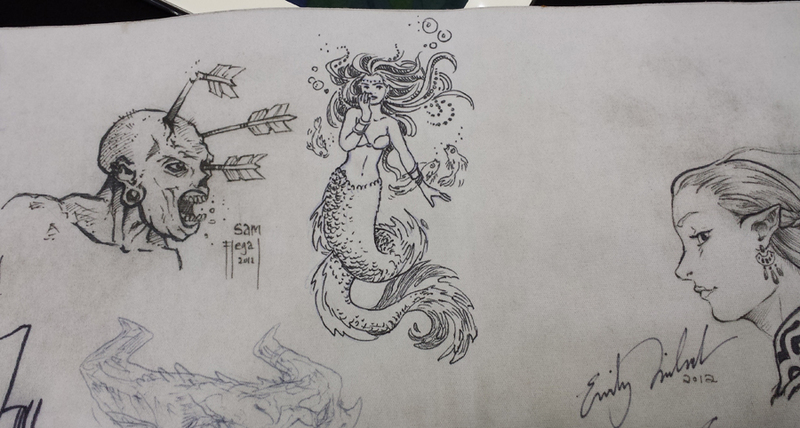 I also did quite a few sketches in sketchbooks, on cards, and on play mats. I’m posting a few of them below. I had a portfolio review with Jon Schindehette of Wizards of the Coast. And I sold three original paintings to some awesome folks! The Girl in Cairn Woods, Baba Yaga, and the small painting of an Egyptian priestess will now grace their homes. Unfortunately I didn’t really get to see any of the convention other than the art show since I didn’t want to leave my booth for anything but the bathroom or lunch. Ah well! I’ve been the past three years wandering all over, so at least I saw it then. We did get to eat a fancy delicious dinner at St. Elmo Steak House, and also saw the Indianapolis Museum of Art which has a pretty great collection! On Friday we had an art show award presentation in the nearby Westin hotel where we got to mingle with the other artists, and I won an award! 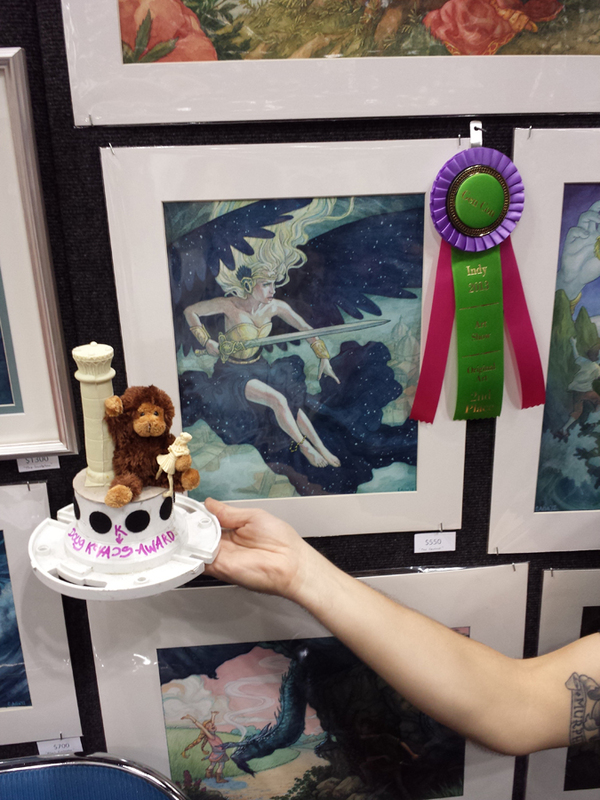 My painting of the battle angle, “The Sentinel,” won second place. I also won the hilarious Doug Kovacs award, presented by Wayne Reynolds. For those not in the know (it’s a Gen Con thing), the Doug Kovacs award is given to someone who isn’t Doug Kovacs… That’s all I’ll say. And I got this sweet sculpture to display on my table! I’d like to thank Jon Schindehette, Emily Fiegenschuh, Brom, and Wayne Reynolds for my awards! I’d also like to thank Barbara Fisher, the art show coordinator, for organizing everything! Congratulations to the other award show winners, especially Aaron Miller who won Best in Show! 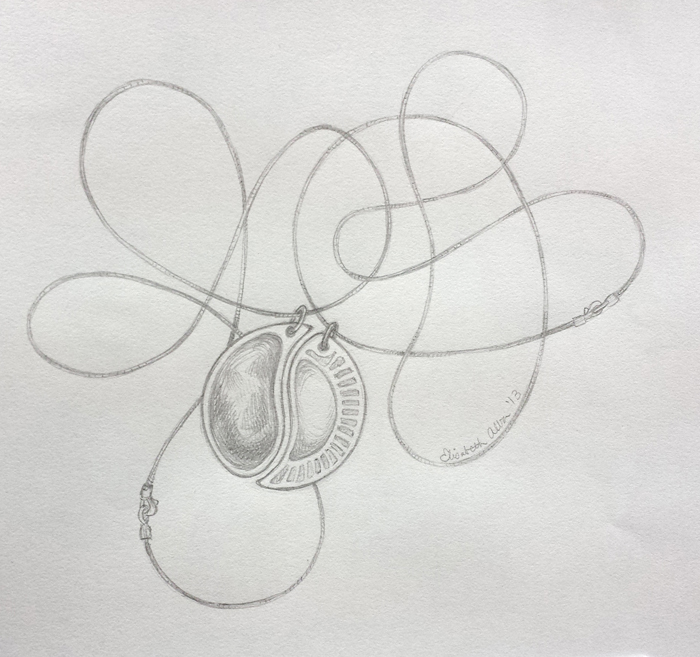 This was for an author, Tamara Vann, who had a writer’s booth at the convention. She gave me a copy of her book, Twenty-Six Roses, and I’m excited to read it! 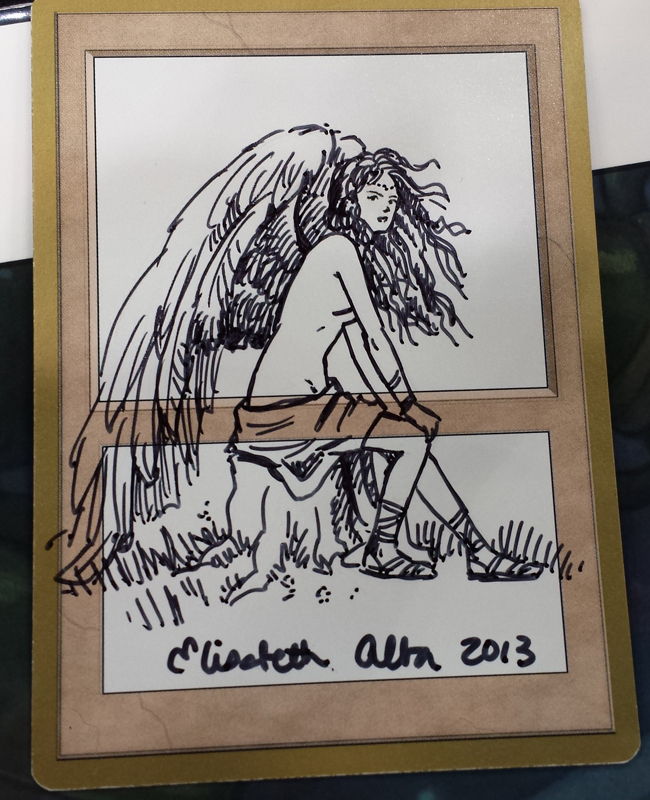 This guy collects angel sketches on blank Magic cards and I got to draw one! 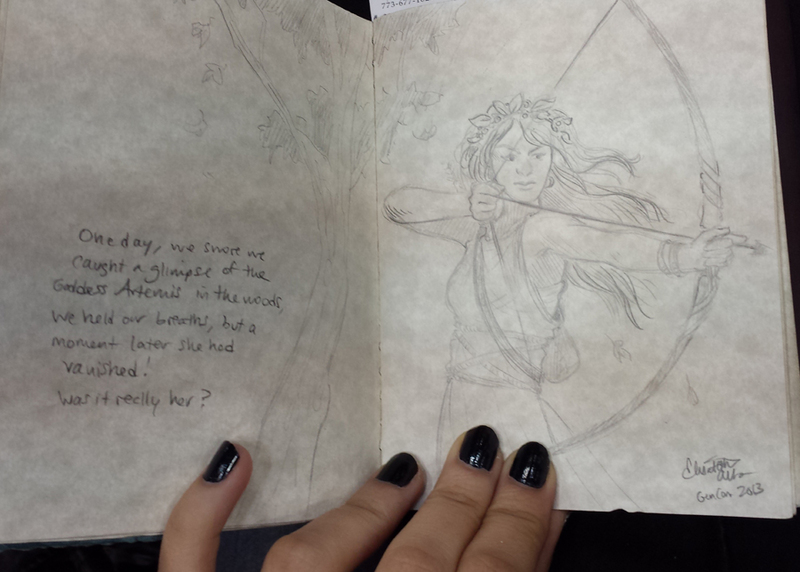 This guy had a little sketchbook that he was filling with images from classical mythology. It had to include text, as if an explorer were writing about his travels. 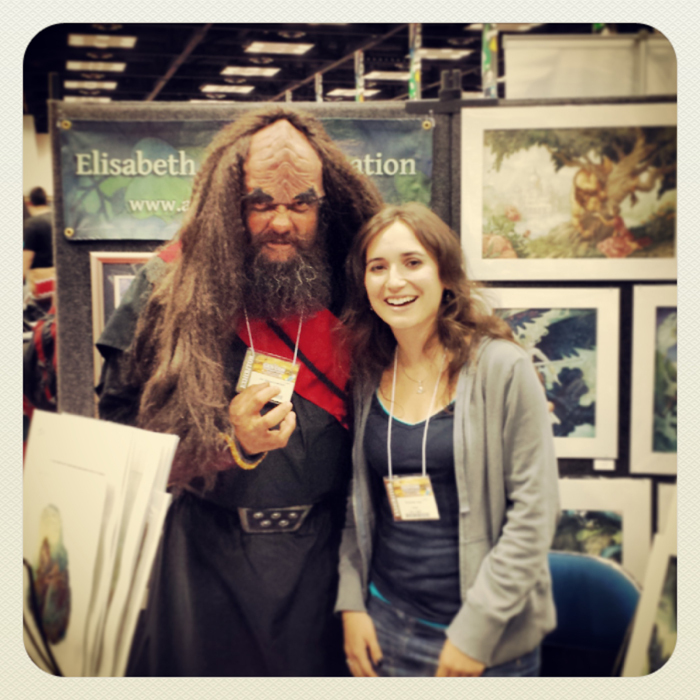 This entry was posted in conventions, fun happenings, Personal, travel and tagged convention, Gen Con, Indianapolis, sketches, trip report. Bookmark the permalink.